Smooth Bromegrass – high yield but 60 to 70% of yield in first cutting with little rest of season. Timothy – short lived (2 to 4 years) and lowest yielding grass. 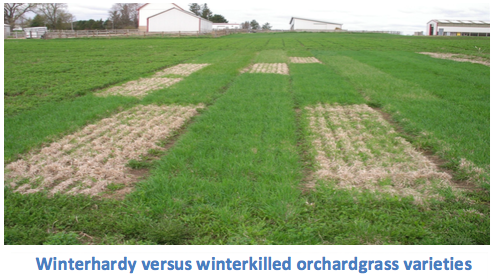 Select tested varieties to ensure adequate winterhardiness (brown rectangles in trials shown at right are orchardgrass varieties with insufficient winterhardiness). Select medium to late mature varieties (cheap seed is early varieties that head before alfalfa is ready to cut). Some varieties head out up to two weeks later than others. Select a variety with more consistent yield throughout growing season (variety with a β greater than −2 from forage website (https://fyi.extension.wisc.edu/forage/). 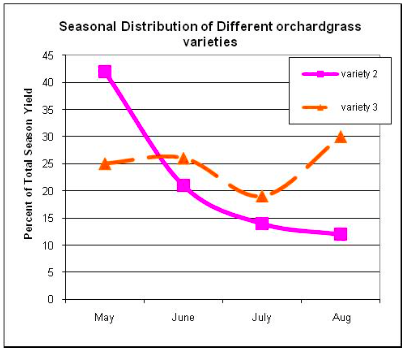 Some varieties have high percentage of yield in first cutting and little growth the rest of the year (purple line). 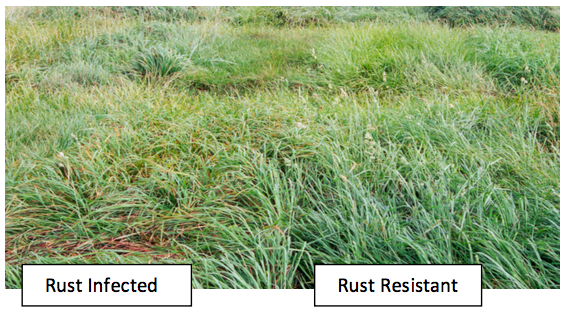 Select orchardgrass, tall fescue, and meadow fescue varieties with rust resistance – rust will reduce yield and reduce animal intake. Rust is orange particles that coat shoes in July and August with walking through fields.